The National Insulation Association is urging homeowners to try and combat rising energy costs by ensuring that their homes are properly insulated. “Householders can save around £265 every year on their energy bills by having loft insulation and cavity wall insulation installed. “We urge consumers to act now, rather than wait for the winter rush to ensure they take immediate advantage of reduced fuel bills,” she said. The advice follows the Government’s latest insulation statistics, which shows that only 57% of lofts in the UK are properly lagged and 58% have filled cavity walls. 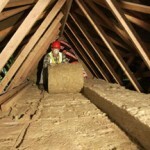 According to the NIA, more than 40% of all heat lost in an average home is through the loft space and walls. It is about time the government provided an incentive, similar to the boiler scrappage scheme, to every UK householder to install loft and cavity wall insulation.